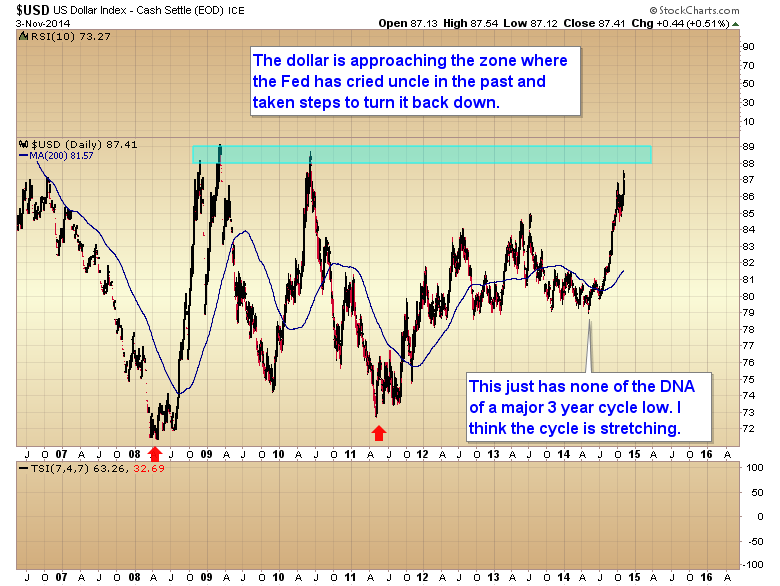 As most of you probably know, I have been expecting the CRB to form a major three year cycle low sometime next summer. However I’m now starting to see some things that might indicate that major cycle bottom is going to occur earlier than I expected. Since oil is the main driver of the CRB, and most commodities will follow its lead I’m going to focus on the action in oil. 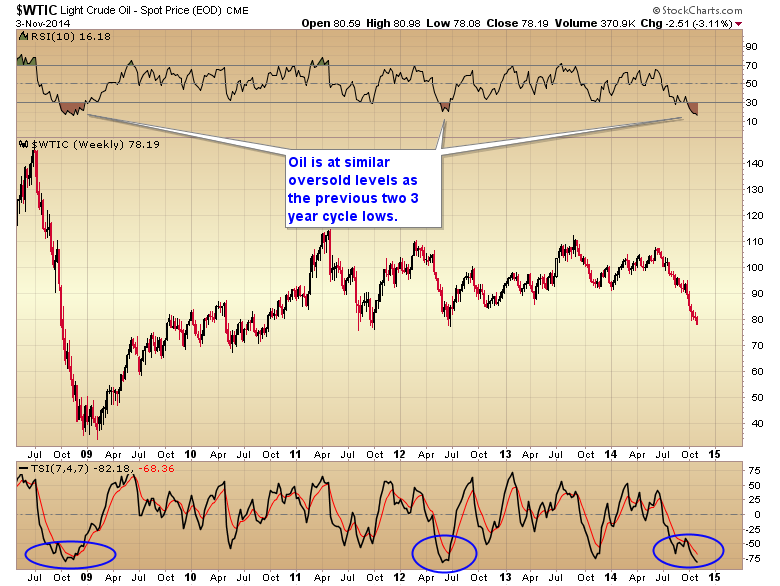 Notice in the next chart that oil has now reached oversold levels similar if not more extreme than the previous two 3 year cycle lows. 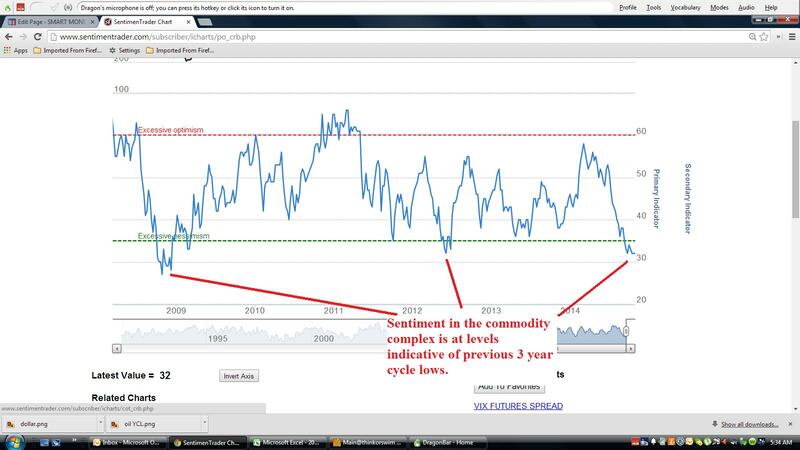 Sentiment in the commodity complex is also at levels last seen at the previous multi year cycle turning points. We’re only days away from a bottom, and it’s even possible the bottom will form exactly on election day like it did in 2012. The movements in currencies are also connected very strongly with the commodity cycles. Notice in the next chart that the euro is within a whisker of testing its 200 month moving average where it has bottomed twice in the past. 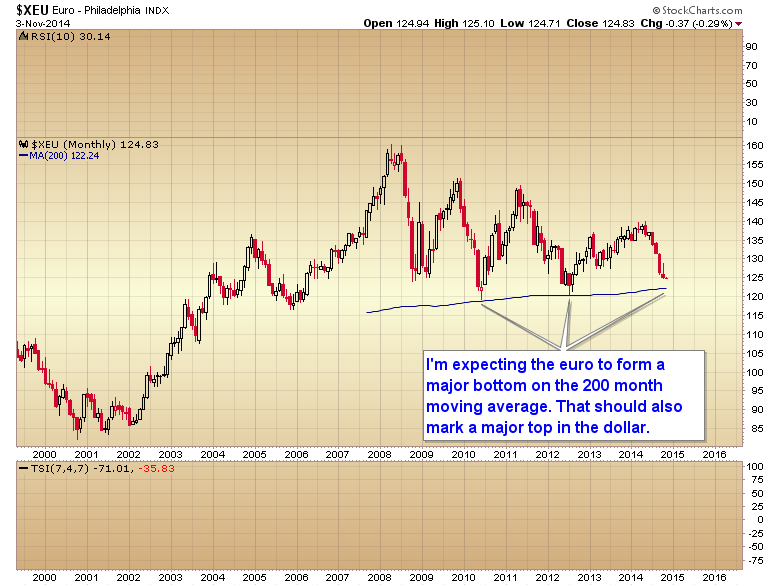 Once the euro finds a major cycle bottom the dollar is going to put in a larger degree top. In the next chart of the dollar notice that it is approaching a level where the Fed has cried uncle in the past and acted to turn the currency back down. Also on a purely cyclical basis, the bottom in May of this year just does not have the DNA markers of a true three year cycle low. I know I’m the only cycles analyst saying this, but I think the three year cycle in the dollar is stretching and we are in the process of putting in a major multi year top right now with a very stretched three year cycle low to be achieved sometime in the next one or two years. This entry was posted in Uncategorized on November 4, 2014 by Gary. 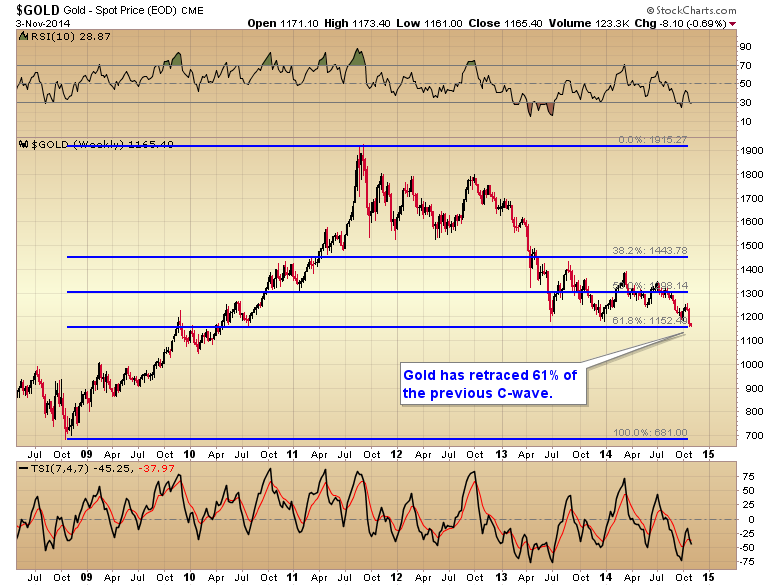 So Gary, if I am reading this right you think that the once in a lifetime time to buy into gold / miners might come sooner than next summer? In other words the bottom in commodities is forming now? Are you saying that the bottom of all the commodities is happening right now? I’m saying there is definitely a possibility. I’m seeing things that usually only happen at a major three year cycle low occurring right now. It is 8.43 AM in the UK currently and gold is getting hammered – down 20 bucks. I have no idea why this is happening but I do wonder whether it is the bloodbath phase that you have been talking about in the past week or so. Gary I told you so a couple of weeks ago, remember 😉 the buying opportunity is NOW or no later than 1-2 months from now.. This is merely a guide to measure change by, a conceptual wishlist of what might be if every sub cycle decided for the first time in history not to change it’s current route . Consider it the way I see things at 14.Jul.2013. Even the act of drawing these things can cloud judgment prevent “clean slate” observation and thought about the market, like writing about it, or being in a trade, objectivity is reduced. Elliott wave counters know that the market is at many moments choosing from a selection of possible options for it’s next move. Cycles and EWT are just ways to reduce the list of possible variants likely to get chosen. This one places a major low at end Oct-start Nov. End of Sept is also credible, and end of December very likely IMO. So stretch it, squeeze it, tilt it up or down, and it will still function as something to compare with the walk forward price action. The reason for more fractal jagged monthly swings going forwards are shown. It is the result of the descending trendlines, and the selling they release upon contact is enhanced while gold is moving across the trendline “lanes” towards the bear exit on the right hand side. But each time it hits one of those descending trendlines it turns back for a bit, creating a zig-zag based fractal for the coming months, classic wave 4 forms are to be expected. The years after the present date are incorrect. It says 2013 instead of 2015. And that 2015 break by the way sort of illustrates my thinking that 2016 will be a high time for gold. Gary… Last June you made a call that it’s 3 year cycle low and obviously it did not turn out due to several reasons like manipulation, higher-than-expected strong USD. Not that I’m questioning your capability as I am sure you call it as things are evident to you at the moment (if wrong then just stopped out not a problem). question if I may ask, would we have more convincing evidence this time around than the past June that this is 3 yr cycle low? Would you happen think 1050 being a sharp v-shape or a side way there? If your time horizon is 3 years +…. buy GDXJ here and wait. The risk is now to the upside and downside may be another 20-30% max. A little confused by your comment that “it’s even possible the bottom will form exactly on election day like it did in 2012.” The cycle low you circled in 2012 was in July, not November. 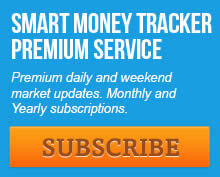 Also curious to know your thoughts about how manipulated this market is. 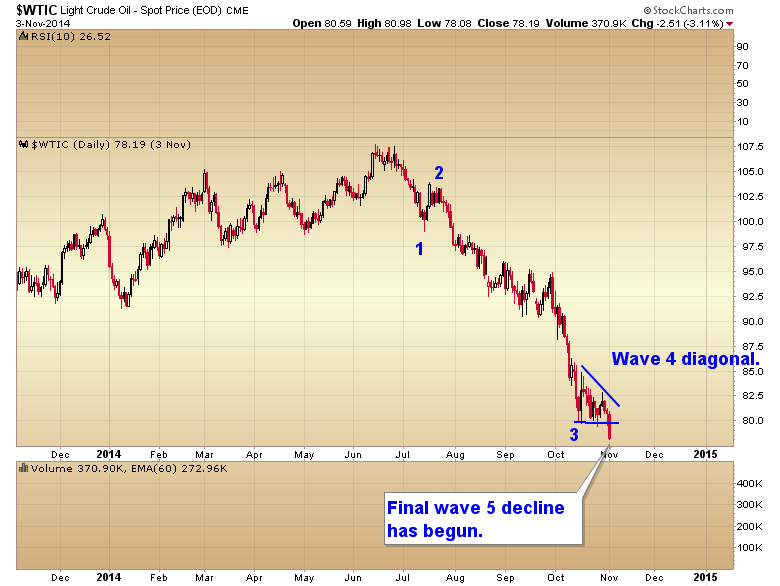 Other forecasters I’ve read are looking for a sharp break lower (one guy said possibly as low as $60). But a sustained market price below $80 could do serious damage to the shale industry in the U.S., as well as potentially damaging the world market as well. Will “they” let that happen? The intermediate cycle that bottomed in the fall of 2012 did so one day after the elections.